:: Once again I am surprised at the passage of time. January has been a bit of a blur. Time off, illnesses (not serious but enough to make you feel a bit sorry for yourself), work and birthdays have all played a part. I’ve been busy but not ridiculously though. It’s just prioritising time at the computer when I’ve been on a computer all day at work or when I’ve been cuddling a poorly child and it’s habit I’ve gotten out of. Anyway, I will be catching up with everyone’s blogs and in the meantime…I’ve been trying to appreciate January and all that sit has to offer. And also working out how 1/12 of the year has gone already!! :: I’m STILL unravelling the hideous mess that is the yarn from hell. It’s taken hours…probably longer than it’ll take me to knit the hat! It’s got a tight tangle at the moment. So I’ve put it to one side less I take to the scissors to unravel it! 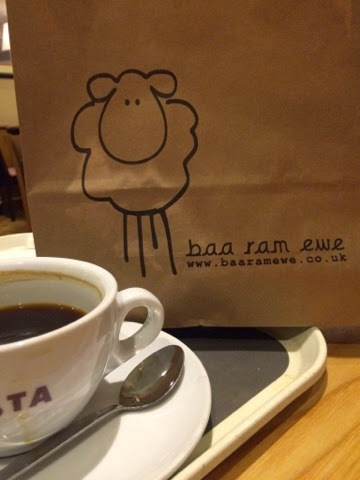 In the meantime I bought some more wool and am going to make the ABO a scarf. I’ve selected mistake rib stitch as it looks fairly simple and fairly achievable, for me. Socks have been side lined for now. I’ve chosen Debbie Bliss Cashmerino Aran in Charcoal. Right now it’s still sat in the bag it came in! :: I’ve been admiring my yarn bowl (thank you ABO) mixed in with my cookery books. As yet it contains no yarn but it does look very nice. We had a bit of a declutter and rearrange which resulted in a trip to Ikea. The trip to Ikea necessities some new frames and a rug too. CDs and DVDs (of which there were many) were moved into a series of wallets and the cases disposed of. CD cabinets moved and replaced with book shelves. Books transferred (this is just a very small sample....can you believe I reduced my book collection when LittleR was born? This was so she fitted into the house) and a myriad of child clutter put where the books once lived. The resulting tidiness lasted about an hour before normal service was resumed. I know I'm fighting a losing battle. Perhaps if the ABO and I moved out there might be enough room for the girls? I'm particularly enjoying reading through Nigel Slater's Kitchen Diaries. I received book 2 for Christmas. He does have a magical way with food words. :: LittleR turned two in the middle of the month and has definitely mastered the art of ripping open a present. I made my usual birthday cake of a Victoria sponge with person specific topping. 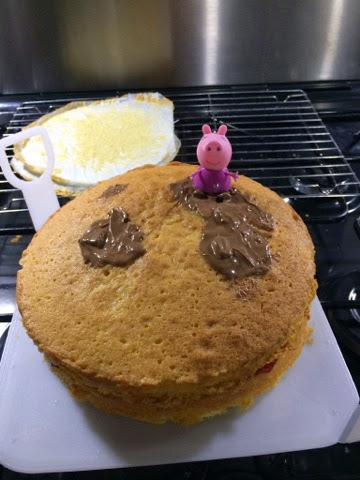 So in this incarnation Peppa Pig jumped in a chocolate puddle. All of a sudden she's a burst of language - sentences flow and there's a constant chatter. 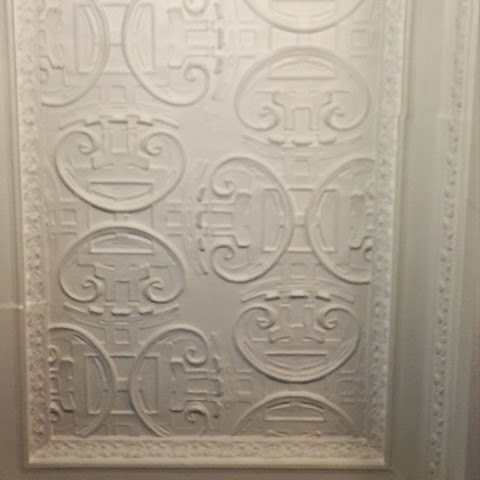 :: I’ve also been admiring Leeds’ hotel ceilings during a break at a work training day. I did do some work too. :: I’ve listened to the entire Serial podcast series. And now I’m mourning its end. Once again late to the party. :: I’ve been lazy and watched a lot of TV. Not sure quite what as I keep complaining there’s nothing much on. Football mostly I think. We're now out of the FA cup but still in the Capital One cup. And there I betray my honorary Yorkshire-ness (although I've lived more than half my life in Yorkshire) and show my true Essex/London/Southern colours. :: I've been cooking but mostly the usual things that we always have. 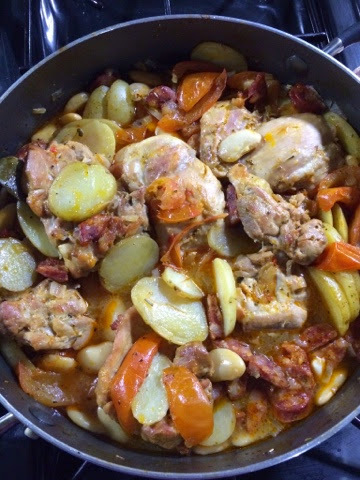 A very tasty chicken, chorizo and butter bean casserole featured. It looked a little anaemic but some broccoli livened it up. 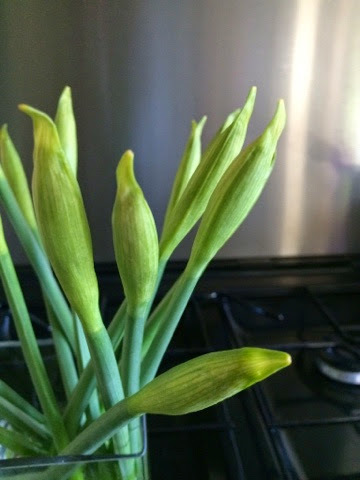 :: I've enjoyed bringing in the first daffodils of the year. They've definitely brightened the kitchen. :: We built the world's smallest snowman with the lightest snow shower. I only had HUGE carrots. A snow bump with an enormous nose. :: I've been making plans for the garden this year. Deciding what we're going to do with it all. We need a more secure gate this year so the children (well, LittleR really, she's utterly fearless) can't escape when my back is turned for a second. A couple of roses have seen better days so I need to dig those out and replace them...not sure with what yet. I've been browsing the seed catalogues for inspiration for the summer. We're definitely growing strawberries again...they were a hit last year. :: Thank you so much for all your helpful comments on my precious things. There are some really useful suggestions for keeping on top of all that precious child art. More snow than us, N! 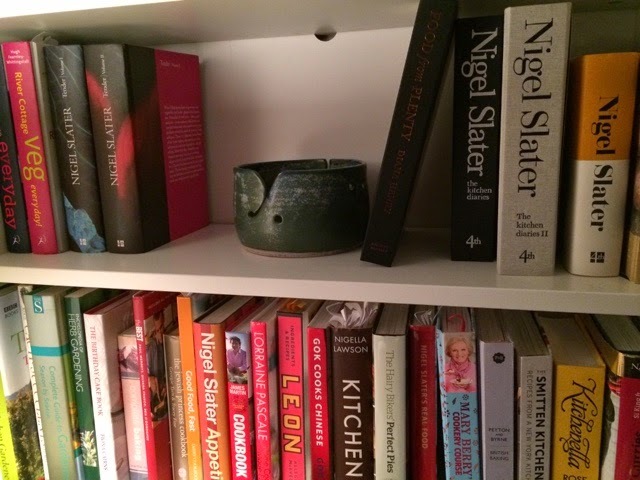 I don't own a single Nigel Slater, which I realise is very remiss of me. Call myself a cook. Lovely January's and I send seaside freshness for better health in February! 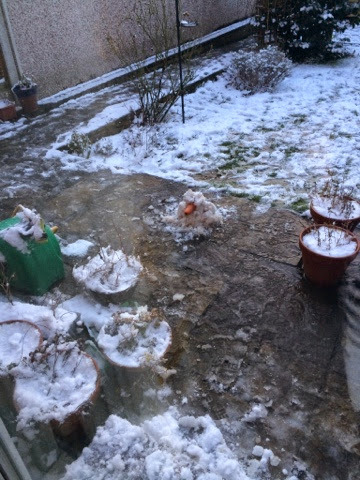 I love your little snowman! That's the kind we build here too, typically. I loved reading about the miscellany in your life at the moment. Happy birthday to Little R, the cake turned out adorably! The cake looks great! And I do love a good look at people's bookshelves... seems we're both Nigel fans. In fact he's on the TV as I type. His voice makes great background noise - so soothing! Also checkout our Pictures of happy new year 2017 new collections.